The ceremony featured remarks from UHD President, Dr. Juan Sánchez Muñoz; University of Houston (UH) System Board of Regents Member Neelesh Mutyala; U.S. Treasurer Jovita Carranza and student speaker Rajni Dhadral. In his address, President Muñoz called attention to the graduates' "Gator Grit"—a distinction recently popularized among University vernacular. Gator Grit refers to the qualities that make UHD students unique from the rest, Muñoz said. "You have commitment—resolve—determination. That grit brought you here today and will no doubt take you far in your careers. You are now and forever a part of UHD, and UHD is now and forever a part of you," said Muñoz. President Muñoz also applauded graduates for their tenacity and commitment to success, especially those who overcame tremendous hurdles brought on by Harvey, a storm that devastated Houston and surrounding cities in late August. He recognized and asked those in attendance to stand if they served as first responders during and after the storm. Also recognized were those who were first in their families to earn a degree, veteran graduates and those who worked full-time while earning their degrees. The next day, UHD hosted the Marilyn Davies College of Business Graduate Program Commencement at the Bayou Events Center, where approximately 400 degrees (MBA and Master of Security Management) were conferred. Commencement speakers included UHD President Dr. Juan Sánchez Muñoz, UH System Board of Regents Member Paula Mendoza, UH System Chancellor Dr. Renu Khator, graduate student Lori Ramirez and Houston entrepreneur and UHD College of Business namesake, Marilyn Davies. Earlier this year, Davies contributed a naming gift of $10 million naming to the College, whose signage was officially revealed and celebrated in an event during the University's "Invest In Blue" week in October. "You dreamed it, you wished it, you wanted it ... you made it happen," she said, applauding students for their hard work and accomplishments. Among those graduating during the event was Paula Mendoza, UH System Board of Regents Member, who earned the rare opportunity to take the stage twice in one ceremony. "Today, I can tell you that I am one of you, a UHD alumna, having received my undergraduate degree in 1995," Mendoza told the assembled graduates. "And today, alongside you, I will receive my second UHD degree, my very own MBA!" Student speaker Lori Ramirez, who received a Master of Business Administration (MBA) degree in Leadership from the College, offered inspiring words to her fellow graduates, emphasizing their potential for continued success. "Whether you are the first in your family to receive a master's degree, sacrificed an entire summer because you couldn't dare miss a six-week class, looked forward to your weekends off of work so you could write papers and study, or all of the above, you are an inspiration to every person here. This is our moment. We finally made it!" Ramirez said. "Congratulations class of 2017. Now let's go and change the world!" 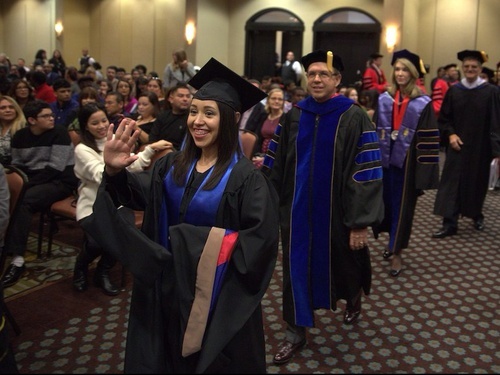 In addition to the general and graduate business commencement events, UHD hosted hooding ceremonies for graduate students in the College of Public Service, College of Humanities and Social Sciences and College of Sciences and Technology.